This painted grey cement block construction complex has a Mid-Century decor theme on all the stairwells surrounding the centrally located pool. The dark entry to the interior of the complex has a low ceiling and feels unwelcoming. 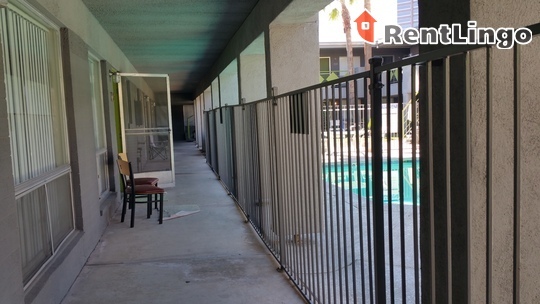 Pros include: Recently renovated apartments are fully rented. The complex is designed so that all the apartments face toward the centrally located pool. 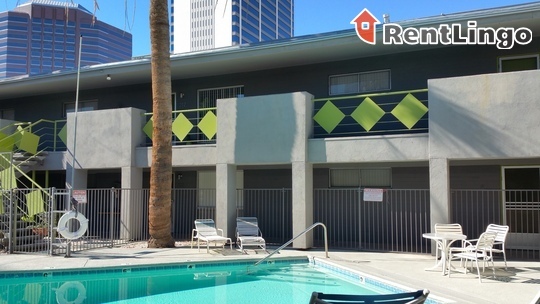 You're walking distance to public transportation and the amenities of downtown Phoenix. On the down side, the entrance to the complex is a big deterrent. Very dark and uninviting, it looks poorly maintained. There were screen doors swung open and hard back chairs just sitting in the walkway in front of some apartments during our inspection. The complex is well located near major businesses, hospitals, light rail and bus transportation. It's set back from the major streets so noise is not a significant factor here. Center city setting convenient to hospitals, downtown entertainment venues, light rail and buses. Villa Riviera is a 38-unit apartment complex featuring 1 to 2 Bed floorplans.